To maintain and increase the love of and the interest in music in the village. To increase the fame and renown of the village by winning competitions. Threequarters of a century later it can be said truthfully that all these aims have been faithfully followed. From 1964, over a period of more than 20 years, before the impact of television, annual celebrity concerts brought into Skelmanthorpe most of the principal soloists of the Sadler’s Wells Opera and many other nationally renowned artists. Between 1962 and 1995 three conductors established the choir amongst the finest in the North of England. Jack Haigh, who arrived at a time when fortunes were at a low ebb, led the choir to 29 first prizes over 14 years. Alan Simmons, who not only continued the competition success story, but brought male voice choir repertoire up to date with wonderful arrangements of “classical pops” plus many original compositions. Choirs throughout the world are now singing his music.
" The exercise of singing is delightful to Nature, and good to preserve the health of man." Stephen Williams maintained the standards set by his predecessors and he carried off the first prize in the National Invitation Championships in his first year. From 1996 to 2002 Steven Roberts, with his experience in performing arts and music, led the choir to a new repertoire of popular concert material. In 2009 our first lady musical director was appointed. Jane Hobson is ensuring that the standard of musicianship is safe in her hands. 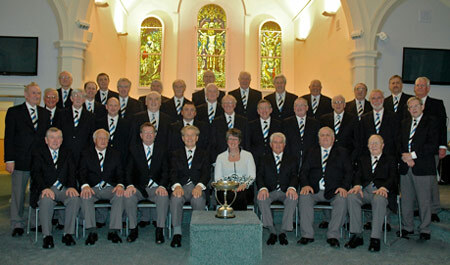 The choir has been highly successful in attaining first prize in the Male Voice Section of various competitions. These include Mrs. Sunderland Festival in 2011 and 2015, Eskdale Festival 2014 to 2017, Wharfedale Festival 2014 and Biddulph Festival 2015. In 1934 out of a membership of 43, only 3 men lived outside the village of Skelmanthorpe. Now membership is drawn from a much wider area and we are actively recruiting new members to the choir. Recruitment in the Skelmanthorpe and Wakefield area has brought new enthusiastic members into the choir.